Having grown up on a small farm, playing in the hayshed and barns, getting to know the animals, giving them pet names and so much more, we totally understand the fascination kids have with all things farm related. Farm toys are fantastic for helping kids to create their own magical imaginative world during pretend play, so we’ve picked the best toy farm for 3 year old kids to have fun playing with. These toy farms allow your toddler to create their own fantasty farm, and the wonderful thing about them is that they can continually add to them over time. We’ve thoroughly researched every single toy before handpicking it for inclusion in our list, so you can rest assured only the best and safest toy farms are recommended. 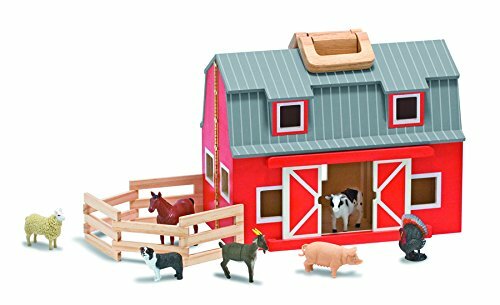 If you’re looking for a wonderful starter toy farm for your 3 year old toddlers, then have a look at this beautiful Melissa & Doug Fold and Go Wooden Barn With 7 Animal Play Figures as it could be the perfect gift idea! Your child will get a beautiful wooden red barn that is very portable and opens up for your little one to play with. When your toddler opens up this wooden toy farm, they will see the stalls for the animals. Included is a ladder so that they can have their toy action figures climb up to the loft area of the barn where there are more stall for more animals. They will get seven farm animals that include a goat, a cow, a horse, a turkey, a sheep, a pig and of course, a farm dog. There is a foldable wooden corral that they can set up and have their farm dog round up their animals into the corral. If they already have some toy farm animals, then they can add them to this set for even more fun, creating their own imaginary farm stories and adventures! The wooden handle allows your child to take this toy with them and they can play with it indoors or outdoors. Several parents shared that they love the quality of this toy farm set, that it is quite sturdy, and that their kids love playing with it for hours on end. Kids have great fun opening and closing the toy barn, rounding up the animals and putting them in their stalls! If you’re looking for a toy that will create the experience of farm life for your 3 year old toddler, then check out this beautiful Fisher-Price Little People Fun Sounds Farm which comes with some play figures. As well as getting the colorful bar, your child will receive a hen, a sheep, a cow, a horse, and a Farmer Eddie toy figure. In addition, they will also get fence pieces and a gate so they can make their own corral for holding the animals when they round them up. This is a wonderful interactive and educational toy farm and comes with songs for your child to learn and sing along to. The doors open and close, there are funny animal sounds to entertain your child, the chicken will cluck while sitting on her nest to lay eggs, and the baler has a bale of hay to feed the animals. Whenever your child opens the barn door, they will hear ‘moo’ or a ‘neigh’ which your toddler will love! You can set the tempo of the songs by choosing upbeat songs for when your child is playing with the farm during the day and slow nighttime songs when you want them to start relaxing and winding down for bed. A number of parents shared that their three year old toddlers love playing with the barn, humming along to the songs in their own words, and playing with the animals. Kids have a blast playing pretend farm with Farmer Eddie and his animals! Comes with a number of farm animal figures, a farmer, bale of hay, fence pieces and more! 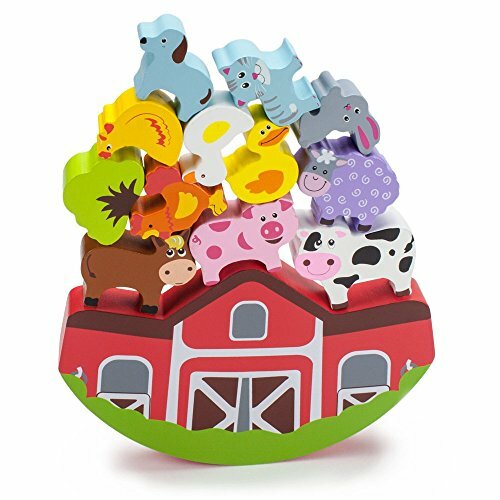 If you’re looking for a cute toy farm for your 3 year old, then you’ve got to check out the adorable Melissa & Doug Latches Barn Toy which is beautiful decorated and eye-catching! This gorgeous wooden barn is beautifully painted inside and out with colorful farm scenes that are sure to capture and hold your child’s attention. The painted scenes feature animals you would find on a farm and in the countryside and your child can have great fun finding them and naming them. In addition to the barn, your toddler will also get four animals to play with – a horse, a pig, a goat and a cow, all of whom fit neatly inside the barn. There are six doors in total, including the main barn doors, and all of them open and close. Each door has a beautiful bronze latch that your child can open and close as they please. There is also a brass handle on the roof of the barn to allow your child to carry the barn anywhere they go, making this a very portable toy farm. Several parents shared that their toddlers love this gorgeous painted barn, especially the doors with the locks that they can open and close, and the animals they can put inside. 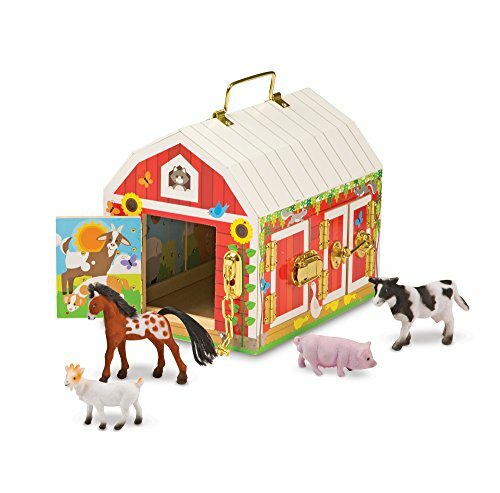 Three year olds love playing with this colorful painted barn and have great fun putting the animals inside! Your little one can play with this farm toy on their own or with friends or siblings for even more fun! You can use this toy to teach your child all about farms, colors, numbers and more! This Melissa & Doug Fold and Go Wooden Horse Stable Dollhouse is the perfect toy farm for any 3 year old that loves horses! This beautiful wooden stable comes with four toy horses, four bales of hay, a wooden ladder to reach the loft in the stable, and a folding corral to keep the horses fenced in so they won’t wander off. It opens up into a beautiful two-storey stable with stall for all four horses and has lots of sliding and swinging doors which your toddler will love! Your child will be able to pretend they are running their very own horse stables and have great fun feeding them the pretend bales of hay when they think they’re hungry, letting them out of the corral for a run and so much more! It’s a wonderful toy for feeding your child’s imagination so they can enjoy some creative play. 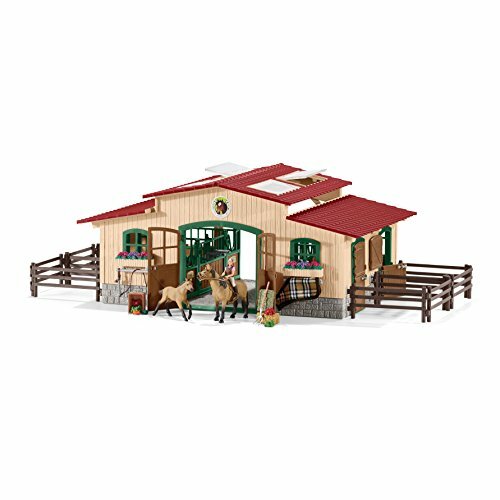 There is a handle on the roof of the stable to allow your child to carry the entire toy farm around with them and it’s suitable for playing with indoors or outdoors. A number of parents shared that it’s super cute, very well made and their horse loving three year olds loved playing with it for several hours. You can always add more toy horses and other farm figures to it for even more fun and excitement for your child! Kids have a blast playing with this gorgeous wooden horse stable, rounding up the horses and more! Can easily add more toy animals to the playset for even more fun for your toddler! If you’re horse loving 3 year old would love to have their very own horse farm with stable, then check out the Schleich Farm World Stable With Horses And Accessories Playset which is a dream toy farm! There is so much to do with this stable with horses playset, that your child will be entertained and having fun for hours on end! Your toddler will get 1 large stable, 1 mustang mare, 1 mustang foal, 1 rider figure, 1 saddle and bridle, 1 horse blanket, 12 paddocks, 1 pitchfork, 1 bale of hay, 1 bale of straw, 1 feed for the horses (carrots and apples), 2 planters with flowers, and stickers! There is so much detail in this horse barn that your child will be super excited and not know what to play with first! The roof of the stable is detachable and your child can use it in combination with the paddocks so that they create an area for their horses to practice showjumping, just like the real thing. There are a number of skylights on the roof and your little one will be thrilled when they see that they can open and close them as they please! The paddocks can be connected directly to the barn or set up independently, whatever your little one prefers. There is so much to do inside the horse bar, with stalls for the horses, a place to put the saddle and bridle, places to put the bales of hay and straw, and so much more! This is a fantastic farm toy to encourage any three year old to expand and grow their imagination, creating their own stories and adventures, limited only by what they come up with! Several parents shared that this horse barn is so cute and they couldn’t believe the leve of details and the number of accessories that came with it. They mentioned that it is very well made and the perfect gift for birthdays or Christmas. Kids have great fun playing with this awesome horse stable and are in awe of all the accessories and details! Perfect toy farm for getting your child into creative play, firing up their imagination! If you’re keen to get an environmentally friend toy farm for your 3 year old, the look no further than the Green Toys Farm Playset which is made from recycled milk jugs. Made in the USA, your child will get a beautiful red and white barn, a pickup truck for doing those pesky farm chores, two farmer cow characters, two sheep and two pigs, as well as fences and a hog shed! 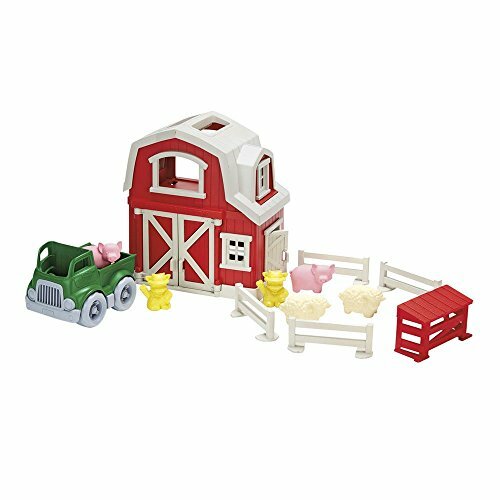 This is a wonderful starter farm toy playset for your toddler and they will have fantastic fun setting up their very own farm and creating their own farming adventures. It is Phthalate and BPA FREE, printed with soy inks and totally dishwasher safe. Your child can open and close the barn doors, set up the corral for the sheep and pigs using the fencing, take the pigs or sheep to market in the back of their pickup truck and so much more! The amount of creative fun play your child will have with this farm toy is limited only by their imagination, and at age three, toddlers love to let their imaginations soar! Several parents shared that they love the fact that all of the pieces fit neatly in side the barn which makes for handy storage. They also mentioned that it is a great quality playset and their three year old toddler loves it! 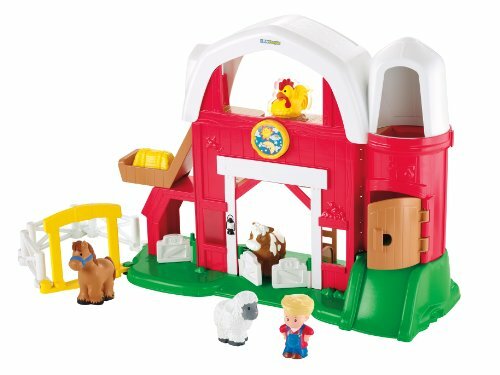 Kids have terrific fun rounding up the sheep and pigs on this wonderful toy farm playset! 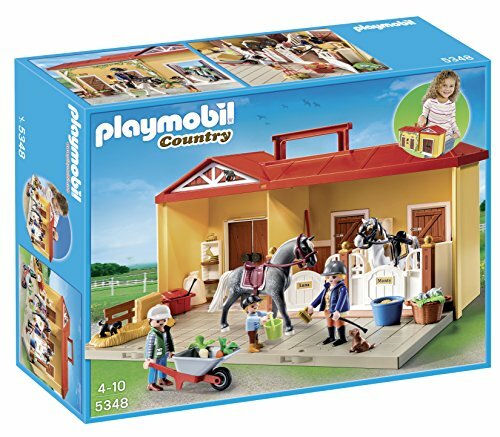 Most toddlers love horses and if your 3 year old is no exception, then the PLAYMOBIL Take Along Horse Farm Playset might be the perfect toy farm for them! This exquisite farm toy comes with lots of interactive pieces for your child to enjoy. 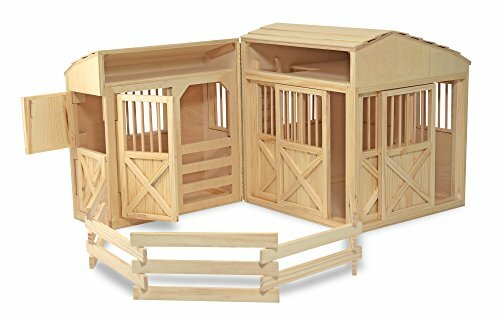 Included in the set is the beautiful stable with two stalls for the horses, two beautiful horses with removable saddles and bridles, a family of horse loving figures which include Mom, Dad and a little child, riding crops, grooming tools and so much more! There is so much for your child to explore in this wonderful farm toy playset that it will keep them happily entertained and occupied for hours on end! Your little one will have great fun putting the saddles and bridles on the horses, taking them out of their stalls, grooming them, feeding them and so much more! This particular horse farm playset will allow your child to really let their imagination run wild and create all kinds of wonderful storytelling adventures. There are nameplates for the horse stalls so that it’s more personal and creates a connection with your toddlers. Also included are lots of items you would find in a stable and on a farm, as well as two super cute puppies! 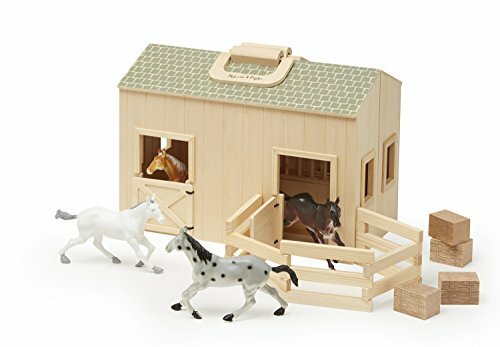 A number of parents shared that this is quite a comprehensive horse farm playset with lots of pieces to keep their child entertained and they toddler absolutely loved it! They also mentioned that it’s a terrific toy for shared play, a great educational toy and the perfect gift for horse loving kids! Kids have a blast playing with this super interactive horse stable farm with tons of pieces to enjoy and play with! Ideal gift for any horse loving toddler! Very well made and parents and toddlers just love it! If you’d like a super fun toy farm that will have your 3 year old toddler giggling with delight and one they can play with their friends, siblings or parents, then you’ve got to check out the amazing Imagination Generation Wooden Wonders Balancing Block Barnyard Playset! Your child will receive a beautiful red barn made from wood with a curved bottom so it sways side to side. They will also get eleven colorful animal and bird pieces made from wood and a grass wooden piece. All in all they will get a cow, a sheep, a horse, a pig, a rooster, a hen, two ducks, a dog, a cat, and a rabbit! The object of this farm toy game is for your child to try to balance as many of the wooden animals on the roof of the barn as they can, without them falling off! Your toddler will have super fun trying to achieve this and if they play with someone else, they can take turns to see who’s animal falls off first! The fun your little one will have will be a joy for you to watch as they learn about balancing, gravity, and farm animals. Of course, they can also play with all the farm animals and birds seperately for even more fun, creating their own farming adventures and stories. Several parents mentioned that this is one cute toy farm and even they themselves enjoy playing it with their three year old! They love the quality and the fact it is made from wood. Kids have a ton of fun trying to balance the wooden animals on the roof of the barn! Will have your toddler in fits of giggles as they try to balance their animal without rocking the barn! Perfect toy farm playset for all the family to play with for even more fun! Fantastic gift idea for any child that loves toy farms! If you’re looking for a top quality wooden horse stable for your horse loving 3 year old child, then look no further than the magnificent Melissa & Doug Folding Wooden Horse Stable Dollhouse With Fence! This beautiful horse stable opens out to reveal 3 gorgeous horse stalls, complete with moving doors which your toddler will love! It also has a hay loft and a corral, making it a very realistic toy for your child. While it doesn’t come with any horse figures, you can use classic sized horse figurines as these will fit, such as the Barbie horses and the Breyer traditional horses. Your little one will love the fact that this beautiful playset has seven working doors as we all know how toddlers just love anything that opens and closes as they are fascinated by that! Parents love the fact that it comes fully assembled as it is a large stable, and they also love that it’s made from solid wood and folds up when play is done. Many parents shared that they love the design and that their kids play with this for hours, making up their own stories and adventures! Kids have terrific fun playing with this beautiful stable, putting the horses in the stalls and so much more! Comes fully assembled which parents love! Wonderful gift idea for any horse loving toddler! 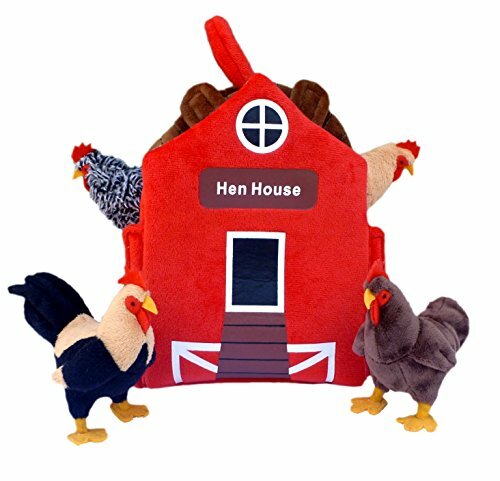 Some 3 year old toddlers love and prefer plush toys because they love the feel of them, and if your child is one of them who also loves farms, then check out this cute ADORE 12″ Chicken Coop Hen House Plush Stuffed Animal Playset! This beautiful red twelve inch hen house is super soft and squeezable, which your little one will love! It opens out on one side and inside your child will find four super cute hens, two on the top rack and two on the bottom! They will be beside themselves taking out each colorful hen, squeezing it close and give each one a name that they like. Velcro straps keep the hen house door closed which is great for tiny hands to work with. There is also a handle on the top of the hen house so your child can carry it around with them and move it from room to room easily without any help. This is one beautiful hen house and a great way for your child to learn about hens on a farm, what they do, why farmers keep them, what they eat and so much more. And whenever they take their hens out of the hen house, they can snuggle with them and hug them, which they will find comforting. Several parents shared that their chicken obsessed three year old loves this cute hen house and will play with the hens for hours! Chicken loving kids have wonderful fun playing with this hen house and four hens!